The American Society of Agricultural and Biological Engineers (ASABE) has consistently recognised Case IH for its quality in agricultural equipment design. AFS Cotton Yield Monitor, an option on the new Module Express 625 that provides precise, real-time cotton flow information. "These awards demonstrate how Case IH continues to serve our customers' needs by offering industry leading, productive equipment," says Jim Walker, Case IH Vice President of North America. "We offer a line of powerful and reliable equipment with features that help our customers maximise their profitability." Annually, the AE50 awards recognise the innovative products introduced the previous year in the agricultural, food and biological systems industries. A panel of ASABE experts selects the top products from around the world, ranking them based on commercial impact, contributions to agriculture and engineering and advancements in engineering and technological significance. Through the use of an on-board packing system, the Case IH Module Express 625 is equipped to help cotton growers’ stage modules for efficient loading. Monitors track percent full, module weight and bales per acre, so the operator can plan drop-off points around the field that are easily accessed by the gin's module trucks. 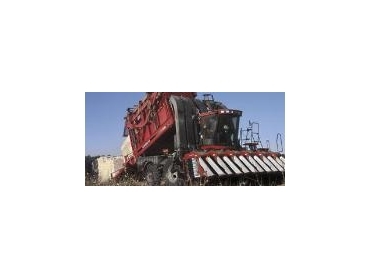 The one-operator, one-machine harvesting system reduces labour and equipment costs. An option on the new Case IH Module Express 625, the AFS Cotton Yield Monitor displays pounds harvested, bales per acre and module weight - all on a touch screen monitor during harvesting. The monitor's ideal Controller Area Network (CAN)-based optical sensor provides precise, real-time cotton flow information. Yield data is accurate to within 3% of gin weights. The AFS Cotton Yield Monitor also creates yield maps to aid in future precision farming management decisions. The AccuSteer system makes the Case IH Steiger row-crop models the ideal precision-steerable four-wheel-drive tractors by allowing the front frame to pivot independent of the rear. The intuitive steering control allows the operator to turn the tractor, and at the end of the 10-degree pivot, the tractor automatically begins articulation. The result is a tight turning radius of just 12.4 feet to tractor centreline and easy turns at the end of rows.